The time really flew by… just making a few blocks each week really added up to a whole quilt much faster than I expected. And sometimes, we all need make a quick quilt. And let’s not forget about how much fun it can be to select the fabrics for each block! All of the quilts in Perfect 10 Quilts start with a layer cake of 10” squares. I used Kristyne Czepuryk’s Guest Room (and a pale pink background - it’s Moda Bella Solid in 3 Sisters Pink) and then added a few fat quarters so that I could repeat my favorite prints. I hope that this quilt has inspired you to make your own sampler. And the book could make a perfect stocking stuffer for yourself! Yay! It is finally my turn on the Vintage Christmas sew along! I have been patiently awaiting my turn to show you some of this week’s blocks. Are you ready? First, let me introduce you to the new book by Lori Holt of Bee in my Bonnet Company. Lori and her publisher, It’s Sew Emma asked me to participate in the book tour. YES! Y’all know how much I love Lori’s patterns. 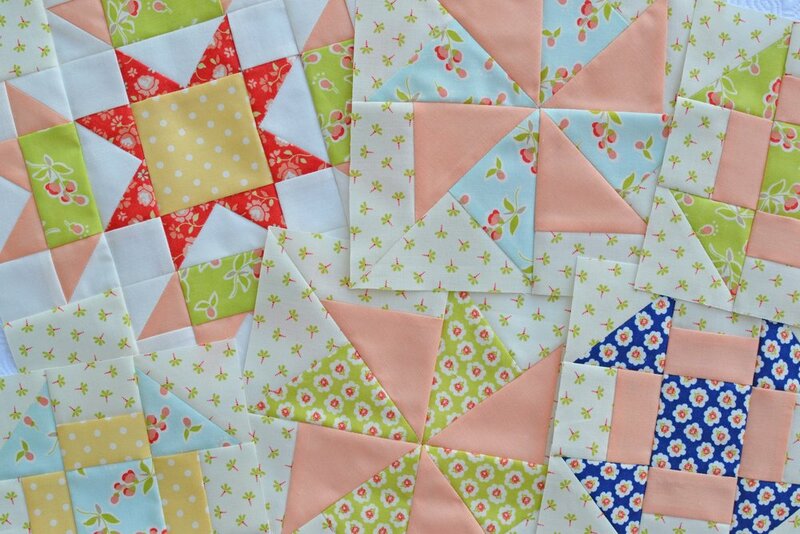 Her quilts always have an upbeat, refreshed vintage, scrappy look. The patterns are easy to understand, you have the option of making blocks in 6” or 12” - and Lori always shows plenty of setting options. 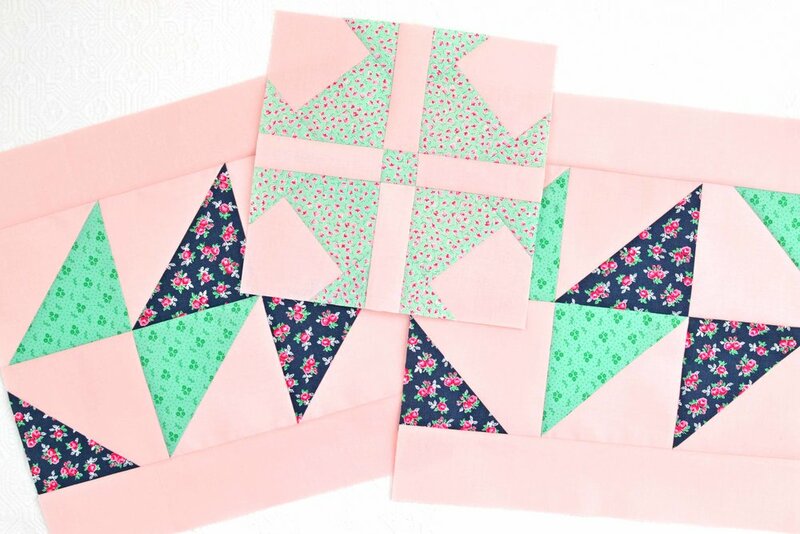 An added plus for me - I can make a block, ooh and aah over it and then make a whole new block (I can get easily bored if I have to sew the same block 42 times). So here are this week’s featured blocks. First, meet Sparkle, the perfect block to showcase some happy gingerbread people. And next is Stained Glass. Once I got started sewing, well, I couldn’t stop! They’re addictive. Let me show you what I mean. I’m working with a bundle of Sugar Plum Christmas by Bunny Hill Designs for Moda Fabrics. It was from last year and it’s now a little hard to find, but Fat Quarter Shop still has some layer cakes available. If you make the 6” blocks you really just need small pieces, so you could easily mix this in with your other stash fabrics. And now I’d love to show you the other blocks that I’ve made so far. The sampler quilt shown on the cover needs 42 blocks, and I've made 15 blocks. It’s time to crank up the Christmas music and keep sewing! Candy Canes block. I am obsessed with the Candy Cane Chill Blizzard from DQ. And peppermint stick ice cream. And Junior Mints. I even have crushed peppermint candy to use as a cake and cookie topper! So, this one was perfect for me. Christmas Candles block - those little leaves are tricky! I needed a warm print for my flames, so I added a yellow stripe from Fig Tree. Christmas Star block. I used some cooler colors here to calm down all those other candy brights. City Sidewalks block. Many of you know that I lived in NYC for most of my life. The sidewalks there are dirty! And so, I thought that I needed to make a candy-like sidewalk. Cozy Star block. Lori shows this in all scrappy prints, but I saw this as another opportunity to use a stripe. Fresh Cut Tree block. Never mind that we have 4 faux trees in our house. But we have that fresh cut tree scent anyway, thanks to lots of candles! Gingerbread House block. This might be my favorite block so far. And it took some concentration and seam ripping, but well worth it. Glimmer block. Candy, stripes and gingerbread-y center. Mmmmm. Glisten block - like a chic, modern wreath. Holly and Ivy block. Oh was this tricky to sew! But like I mentioned earlier, only one block is needed and that is always do-able. Ice Skate block - my other favorite block (so far), and this was the first time that I used the reindeer print. Jingle Bell block. I struggled with my fabric choice, rearranging fabrics over and over, and I’m still not completely happy with it. But it will stay in the finished quilt; I’ll just make a few other pale blocks so it won’t feel lonely. I’m glad that you joined me for this book tour today. I’d like to thank Lori Holt, It’s Sew Emma and Fat Quarter Shop for inviting me. Now, if you’d like to pick up a copy of Lori’s book, they are available at Fat Quarter Shop here. And have fun sewing your own blocks! If you have a moment, please visit these other bloggers today as they share their blocks. perfect 10 quilt along week 7, plus a preview! Hi everybody! I hope that you all had a wonderful Thanksgiving. We drove to Ohio for a small family gathering. Lots of yummy food and good times. And then it was over and we were back to yardwork. (I planted bulbs! 50 pink tulips right outside our kitchen window, and the beginning of the daffodils are now in the ground.) And of course, today is Perfect 10 Tuesday! Aren’t those Neapolitan blocks fun? I loved Neapolitan ice cream when I was a kid, and I still do. And these blocks also remind me of those paper “cracker” holiday favors, as well as a fancier bowtie block. The Peaches n’ Cream block…. ok, I don’t know how it got that name, but mmmm peaches. 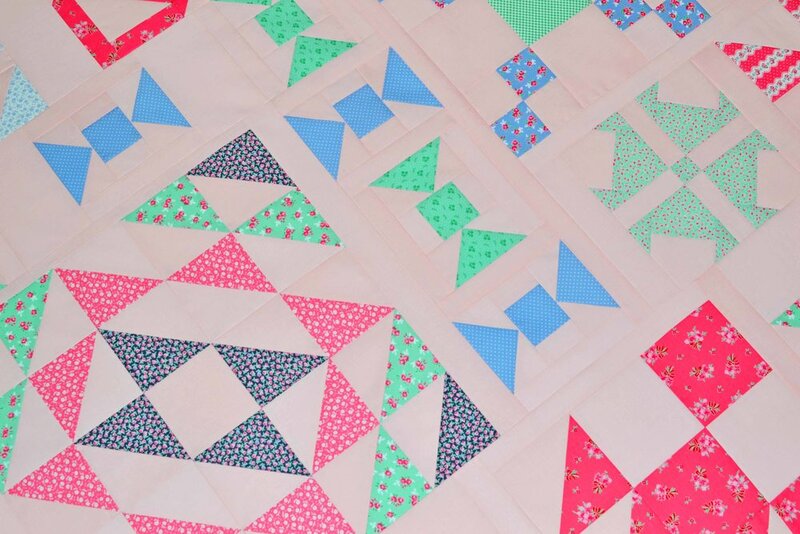 Both block patterns are from the Perfect 10 Quilts book by It’s Sew Emma, and it is available at Fat Quarter Shop here. And now for something completely different. Here is a preview of a new project that I’ve been working on. They’re 6” blocks from Lori Holt’s new book, Vintage Christmas. I’m making the amazing sampler quilt which features 42 different blocks. The book also has instructions for 12” blocks, so there’s lots of flexibility here. I’ve made 14 blocks so far, and I’d sew them all day long if I didn't have other things that need to get done. My official date on the book tour is this Friday. So be sure to come back to see lots of cuteness! Hi everybody! More foodie-inspired blocks for this week’s installment of the Perfect 10 quilt along. That’s the Mint Chocolate Chip block on the left. I sure am getting my share of half square triangles to trim in this quilt! (I do realize that I could have used a minty green print for this block but I didn’t even think of that until I finished the block!) And then we have Lemon Sorbet blocks on the right… more half square triangles to trim, but otherwise, super simple to construct. I’d love to show more photos, but our weather here has not been photo-friendly lately. And nobody wants to see gloomy photos! I enjoyed a staycation last week and accomplished a bunch of sewing, some cooking and baking (I made my very first fried chicken EVER from Ina Garten’s new cookbook and it was not scary at all) but mostly I did… leaf removal. EEK do we have leaves here! I try to be a good homeowner and I remove them before they start blowing around. I have a neighbor who told me that he likes when our leaves drift into his backyard and it makes him feel like it is fall. Okay… Another neighbor vacuums her lawn (I am NOT kidding, and she has the best looking yard). And then there’s me with the leaf blower, leaf mulcher, rakes, bags, the works. At least my new noise-cancelling headphones have Bluetooth so I can listen to fun music while I work. But back to the quilt along! I’m sure that y’all know it by now, but in case you forgot, I am using the new Perfect 10 Quilts book from Fat Quarter Shop, along with a bundle of Guest Room fabric by Kristyne Czepuryk for Moda. We have just two more weeks to go until the quilt top gets assembled! And then for the French Vanilla blocks, well, you basically cut up 4 layer cake squares and sew them back together. Can we call these easy bake blocks?! As always, I am using the new Perfect 10 Quilts book from Fat Quarter Shop and the Creative Grids Perfect 10 ruler, along with some Guest Room fabric. And we have just a few more weeks before we start to assemble our sampler quilts! It’s week 4 already! This quilt is going together really quickly. These two blocks are my favorites (so far), probably because this Guest Room fabric reminds me of my favorite shirts; there are 19 blue shirts in my closet! Here is the Cookies ‘n Cream block. It’s never too late to sew along! Or else, just add a fun new book to your collection - surely I am not the only person who reads quilt books in bed?! 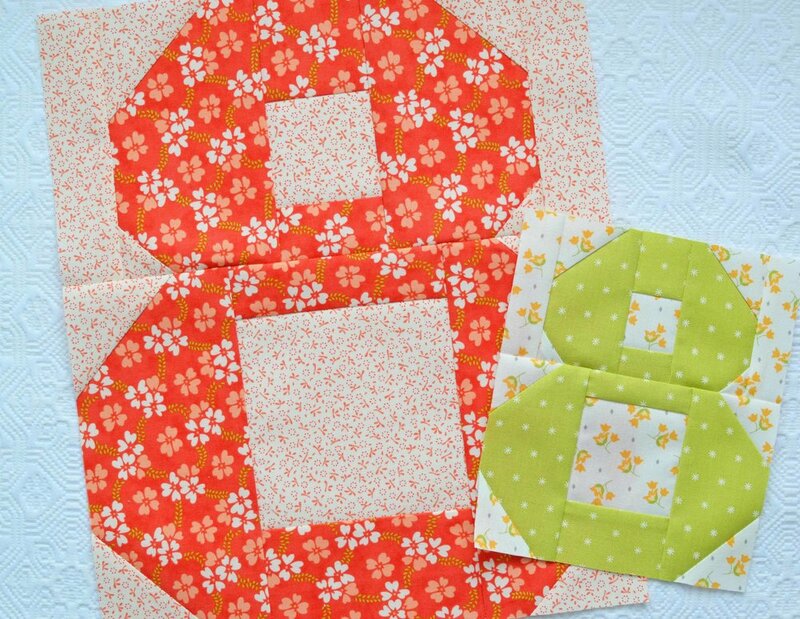 Find your copy of Perfect 10 Quilts at Fat Quarter Shop. And a Cookie Dough block! I’ve had a few requests for information about my fabric and pins, so I’d like to share my whole resource list with you right here. Please excuse the fact that I didn't think to photograph my supplies! My pins are always Clover #2507. I’ve sewn with them exclusively for many, many years. I love them because they are long and thin and don’t distort the fabric. I separate them into blue pins and yellow pins, and I use them for different purposes. I store my pins in magnetic pinbowls. They are great because I can turn them upside down and the pins don’t fall out! I don't even need to be too careful; just aim the pin in the general direction of the bowl and it magically ends up in there! I also occasionally run the bowl over the carpet to pick up any stray pins. And in my house, this makes my sewing studio a bit more Chloe cat friendly. The print fabric that I’m using for my Perfect 10 sampler is Guest Room by Kristyne Czepuryk. This is Kristyne’s second collection for Moda, and it mixes nicely with First Romance. I love how Kristyne has rolled all of my favorite types of prints into one collection - cheerful florals, gingham, dots, wallpaper stripes, and even some tonal backgrounds. My background is Moda Bella Solids in 3 Sisters Pink, and I think that it might be the most perfect pink fabric ever! And let’s not forget the pattern! It is the new Perfect 10 Quilts book from It’s Sew Emma. The book features 16 quilts using the Creative Grids Perfect 10 ruler. I’m going to try to return soon to show you some of the other projects that I’ve been working on! Hi everybody! 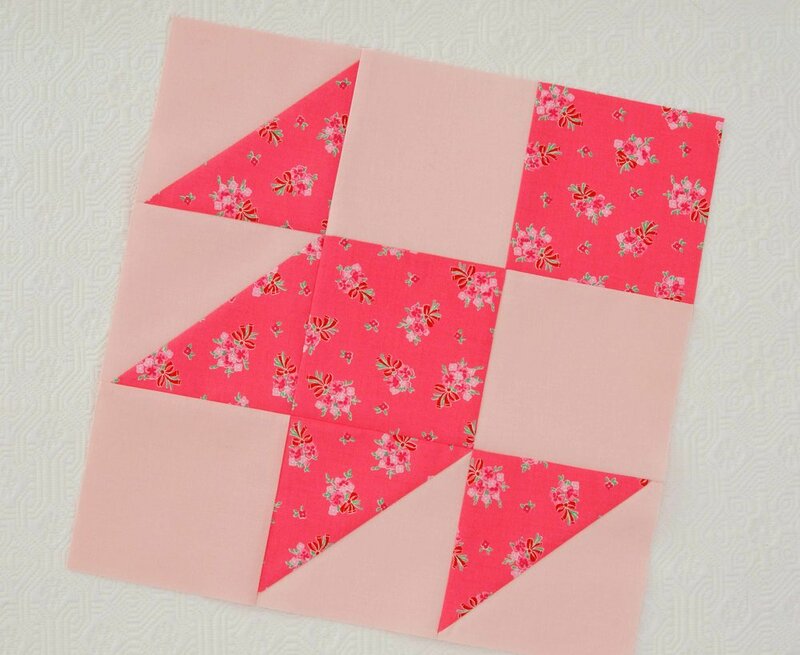 It’s week 2 of the Perfect 10 Quilt Along, and I am back with more bright and happy blocks. I thought that this was the perfect time to break out one of my recent purchases - a new pin bowl that coordinates with the Guest Room by Kristyne Czepuryk fabric. And yes, I have a collection of pin bowls! Just make three blocks this week and you’ll be up-to-date. First up, the Buttered Pecan block. Make two of them. Next is the Coconut block. Are these block names making you hungry for a snack? They’re all really easy to make and definitely do-able for beginners. The instructions for each block are in the Perfect 10 Quilts book by It’s Sew Emma are super-duper-clear and easy to understand. And of course, the Perfect 10 Ruler makes cutting a breeze. (There’s even a combo pack with book and the ruler.) All items are available at Fat Quarter Shop by clicking the links. I’m now going to check out the blocks that my quilty friends are making. And I think that you should join me! Here is a rendering of the quilt that we will be making. It will be interesting to see everybody’s fabric choices. I’m going with the fabric shown in the diagram. And how could I resist?! It’s the new Guest Room fabric collection by Kristyne Czepuryk for Moda Fabrics. (You may know Kristyne by her blog name, Pretty By Hand.) I’ll mix it up a bit and not use the prints exactly as shown, and I am using a PINK background! It’s Moda Bella Solids 3 Sisters Pink. Here’s the Banana Block. I used my favorite print from Guest Room. 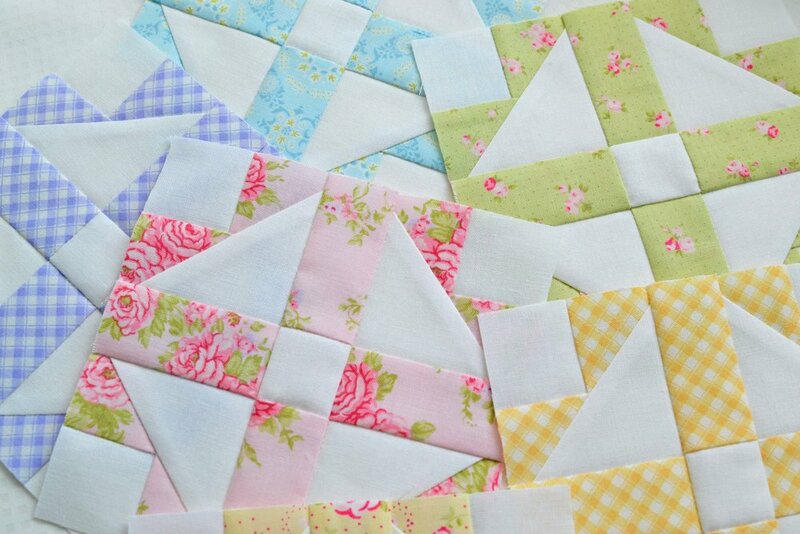 I think that I really need an entire quilt made of banana/bowtie blocks! And then there’s the Birthday Cake block, made with the cutest wallpaper stripe. I’ll be back each Tuesday with two new blocks for you. And I need to go check out my quilty friends to see which fabrics they’ve chosen! Hi there, everybody! Welcome to Spelling Bee Saturday! I was invited to sew along with the group, and it's already week 40. The Number 8 block comes in two sizes, and it is in Lori Holt's latest book, Spelling Bee. The book includes complete instructions for 100 letter, number, punctuation and image blocks. Each block comes in two sizes, so I made both! There are also instructions for many quilt projects using these blocks - cute sayings, mini quilts and of course, the cover quilt. For my large Number 8 block, I used Fig Tree's Ella and Ollie fabrics. The small 8 is made of Christmas Figs and Corey Yoder's Pepper & Flax background. I chose to make the 8 because it is my favorite lucky number! I loved growing up in the 80's, and 80's music and fashions have always been my favorites. I moved to NYC in the 80's, and my apartment was on East 82nd Street. 8 is a lucky number in the Chinese culture, and our best local Chinese restaurant is called China Bistro 888. One of my favorite childhood toys was the Magic 8 ball with the floating fortunes ("Concentrate and ask again" and "Reply hazy, try again" always drove me crazy). When I sign my name, my capitol letter G looks like a big freeform 8. (Even my phone number and email address include the number 8!) And then there's the never-ending infinity loop appearance of the number 8. The sew along is nearly complete - there are just a few weeks left. Please hop over to today's blog posts from Fat Quarter Shop and Lori Holt to learn more. It's the final month of the Patchwork Quilt Along! And I'm a little sad to see it end. I've had so much fun watching the stack of blocks grow each month. I've kept a log of how many times I've used each color to make sure that I have a fairly even distribution (for the record, that's 14 pink blocks, 12 grey blocks, 12 blue blocks, 10 green blocks, 10 yellow blocks, 8 purple blocks, 6 red blocks). My blocks are all made with Brenda Riddle's Fleurs fabric. 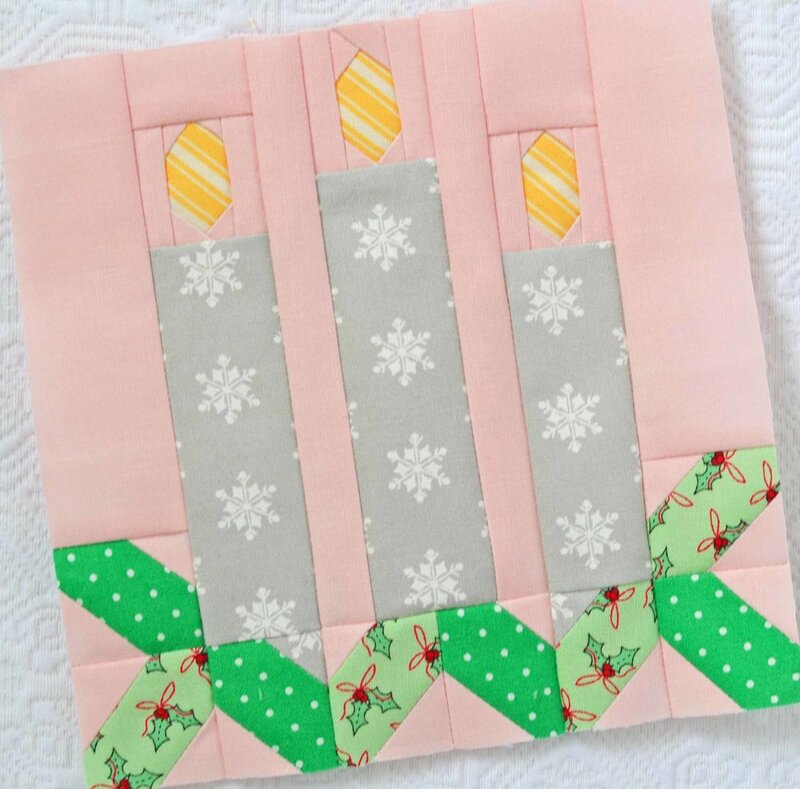 This month's blocks feature my kind of Christmas colors - traditional red and green, mixed with pink and silvery grey. Quick, easy blocks again this month. That leaves more time for Christmas decorating and cookie baking! 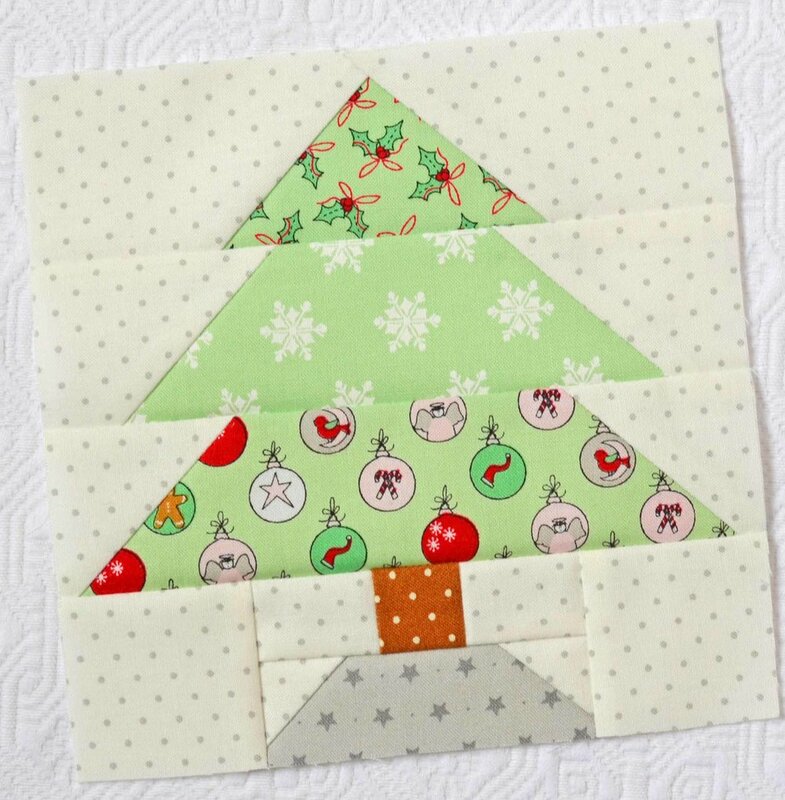 The final block pattern is now posted on Fat Quarter Shop's Jolly Jabber blog, along with the quilt assembly instructions. I'll put my quilt top together in January (I have a few red and green projects in the works this month!) 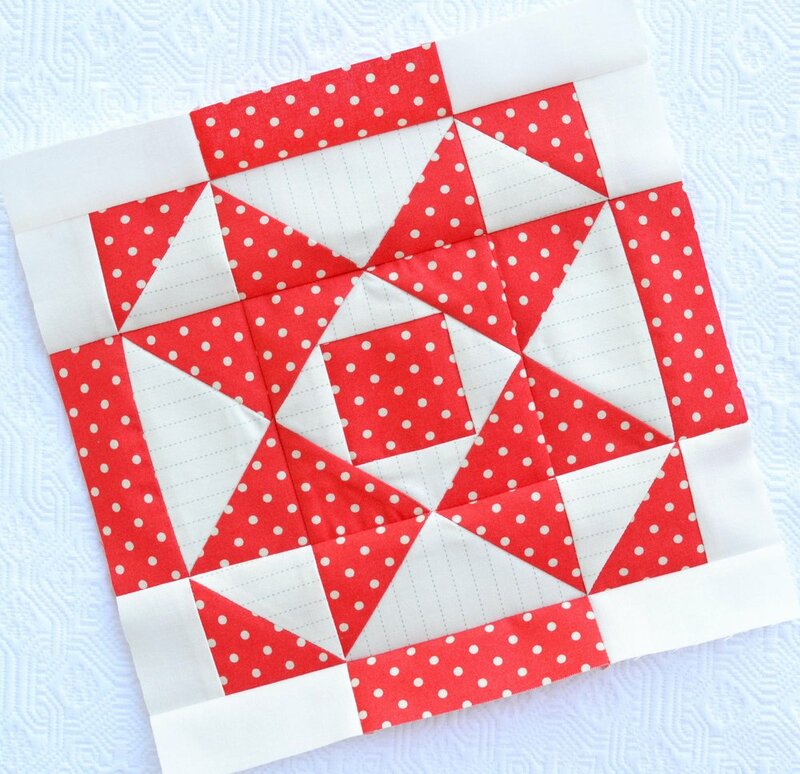 To recap this quilt along: visit Fat Quarter Shop's blog here to download your block pattern. Please consider making a donation to Make A Wish of $5 for the use of the pattern (we've raised over $12,000!). And enjoy your quilt! Thanks for following along with me as I made these blocks throughout 2017. Now what's next?! Hi there! You know what time it is... it's Patchwork Quilt Along 2017 time! November's block is called Spinning Tops. I can't believe that this quilt is almost ready to be assembled... just one more month to go. I still love working with Brenda Riddle's Fleurs fabrics. But you may have noticed a lack of red prints in my blocks. Here's why. I originally made a few red blocks, but I thought that they distracted from everything else. I planned to redo them. But then I realized that the all the other blocks could benefit from just a small dash of red. I'm thinking of the red as being like a sprinkling of sea salt on a baked potato (it's always about food!) - something to enhance without distraction. I only had one truly overpowering red block that really needed to be redone. Here is the original block, along with the redo. Much better, right? Thank you for stopping by today, and happy sewing! Um... happy belated Halloween? Ok, I know that it's a little crazy to show you a Halloween quilt now... except that this might be a good time to shop for Halloween fabric at clearance prices, right? Here's the backstory. I was a part of the book tour for Holiday Wishes by Sherri Falls in July 2016. All of the patterns in the book use Christmas fabric. But I challenged myself to be different, so I reinterpreted the Gingham Stars quilt in Halloween prints. I used a fat quarter bundle of Spooky Delights by Bunny Hill for Moda Fabrics. Don't even ask me how we found time to decorate the outside of the house, but I couldn't get myself to stitch that binding! Yes, those chrysanthemums are pink! A big thank you goes to Sherri Falls for writing such a great book, and also to Kaylene Parry for her beautiful modernized Baptist Fan quilting. Welcome to my stop on the Tablerunner Bliss book tour! I was happy when author, quilter and designer Sherri Falls and Fat Quarter Shop asked me to participate. After all, I had so much fun making a Halloween quilt from Sherri's previous book. Tablerunner Bliss has twenty tablerunners. It was difficult choosing just one, but I love the Picnic pattern with swirly pinwheels. And for my indoor holiday picnic, I knew that I really wanted to use Minick & Simpson's Snowfall collection. All you need for this runner is a charm pack, two fat quarters (I used three), and fabric for the backing and binding. This runner is super duper easy. Just make twelve pinwheels and set them with alternating unpieced squares. Of course this means making a few HSTs! The runner finishes at 14" x 54". I wanted this runner to fit our new 72" dining table, so I made one additional block, resulting in a runner that is 68" long. And in just a few days, I had a new Christmas runner! Time to bring out the vintage Spode china and pour a cup of tea. And that's just the beginning. There are many, many more runners in Tablerunner Bliss, with clear instructions and lots of diagrams. Thank you, Sherri and Fat Quarter Shop for inviting me to sew along. It was fun! Hi everybody! Just a short and sweet post today to show you the latest batch of blocks for the Patchwork Quilt Along 2017. It's called Country Roads. I usually like mix up my prints each month - some florals, some directionals, some ginghams. But when I looked at all my blocks that I've made so far, I was very short on gingham blocks. How can that have happened?! I love gingham! So I took care of that "problem" quickly. I'm sure that you all remember Patchwork Quilt Along 2017 is a charitable quilt along to benefit Make-A-Wish. Fat Quarter Shop and Moda Fabrics are matching our contributions! Read all about it and find the pattern download on the Fat Quarter Shop's blog here. Thanks for stopping by, and enjoy the rest of the weekend! I am fully caught up on ALL four of my blocks-of-the-month programs! Here are all of the Fig Tree Red & Cream BOM blocks. There is just one month left, and we've been told that there will be a center medallion block so I am dying to see how this is all going to come together. 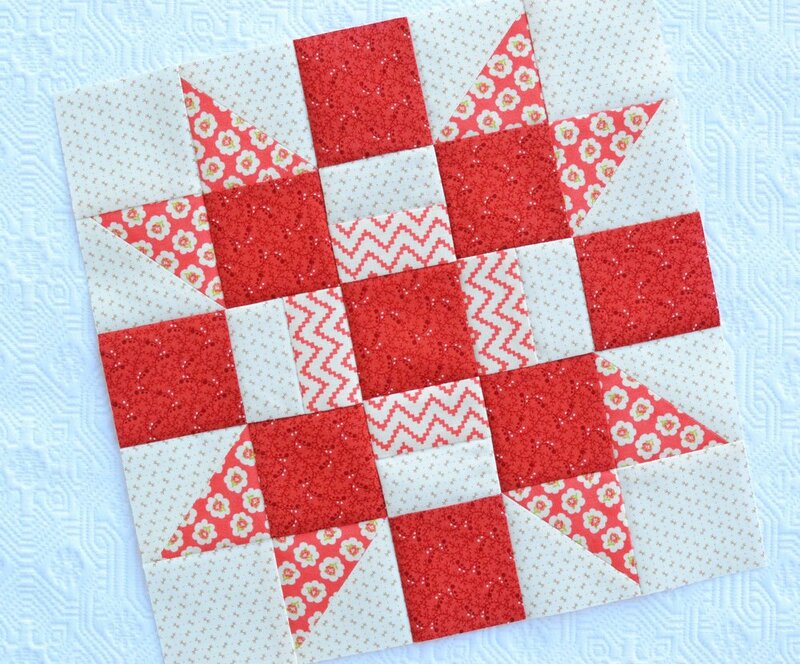 Maybe I'll have a new red and cream quilt just in time for Christmas. In house news, our landscaper was here this week to rework the front of the house. We've been plotting this for several months. Gone are the prickly barberry bushes, burnt cypress plants and red lava rocks, replaced by two types of holly, arborvitae, hydrangeas and finally, wood mulch. I'll have to show you the before and after shots soon. MUCH BETTER. I will be back on Sunday with the latest block in the Patchwork Quilt Along! I'm nearly caught up with all the blocks-of-the-month projects! I may have taken on too many BOMs this year. Is four BOMs too many?! But I love all the blocks and it makes me so happy when they come together, so I know that it is worth it. These blocks are all part of the Fig Tree Nantucket Mystery Sampler BOM. I've got some fun projects in the works... well, they'll be in the works if I get them started! Fat Quarter Shop was kind enough to send me a copy of the latest book from Sherri Falls. It's called Tablerunner Bliss and it has 20 tablerunners. Lots of fun for sure! Sherri's patterns are always clearly written and easy to follow. Do you remember when I made Sherri's Gingham Stars quilt last year? I get emails about that quilt all the time - apparently it's out there on Pinterest. Anyway, I'll soon be starting a fun runner project so stay tuned. Check out Sherri's new book here. And in house news, we've booked a landscaper for early October! He is going to remove several bushes from the front of the house and plant new ones - I am so excited to add hydrangea (they're Endless Summer Bloomstruck), China Girl holly and Sky Pencil holly to the front landscape. (Goodbye thorny, prickly, scrawny bushes!) He'll also start to remove the lava rocks and replace them with wood mulch. And yes, I know that I owe you all some updated house photos, and I'll try to get them for you soon. Thanks for stopping by today. I'll be back on Friday with the latest batch of Patchwork Quilt Along 2017 blocks. Hello, happy people! I can hardly believe that summer is almost over. It seems like it truly just started and now the stores are full of fall things. Actually, I'm looking forward to cooler temps and I know that our lawn definitely needs a break from the sun! Today I'm sharing the latest Patchwork Quilt Along blocks, and we're already on the eighth month. These blocks are flying by just as quickly as summer. They're the Rolling Nine Patch blocks. Just make a nine patch and add a few borders and your blocks will be done! Super simple! A link to the pattern is right here on the Fat Quarter Shop's blog. As always, the pattern download is free, but please consider donating $5 for the use of the pattern to Make-A-Wish. So far, quilters have raised $11,087 - we've exceeded the goal! Hi everybody! I'm sewing along with Fat Quarter Shop's 2017 Patchwork Quilt Along, and this month's block is called Propeller. Wikipedia defines "propeller" as "a type of fan that transmits rotational motion into thrust." It's definitely going to add some motion the quilt! Propeller is a fun and quick block to sew. The six blocks took me just a few hours, and I used this opportunity to use some of the larger prints from Brenda Riddle's Fleurs collection. The sew along is sponsored by Fat Quarter Shop and Moda Fabrics, and it is also a fundraiser for Make-A-Wish. The pattern downloads are free, but a donation of $5 to Make-A-Wish is requested for the use of the pattern. You can find the full details right over here on the Jolly Jabber blog. I also did some catching up on prior month blocks (not like I was behind, of course!) and now I'm ready for next month's blocks! And here are all the blocks so far. Speaking of propellers... I have 6 business trips coming in the near future, and I just returned from a meeting in Miami Beach late last night, so I am going to be near a lot of propellers! And I better get my hand sewing projects ready to work on in my hotel rooms! Thanks for stopping by today, and I'll see you soon.